← Guilin, China. June 10th, 2012. Hudson, Florida. 21st June, 2011. 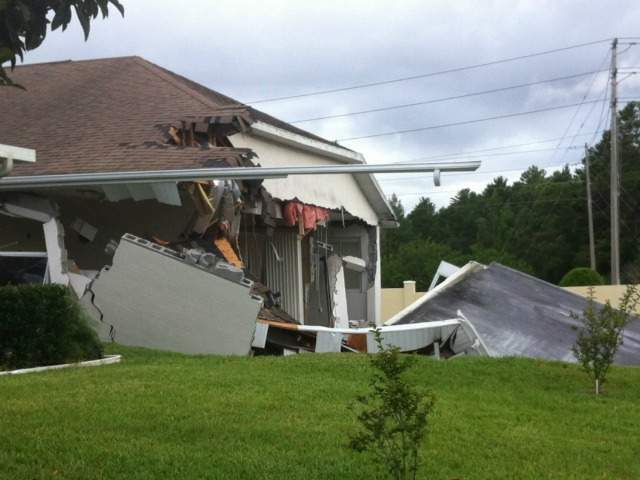 At about 3 p.m., a sinkhole under the back half of her home began to collapse. Forty-five minutes later, half the house was gone, and county officials plastered a dark orange sign with black block letters spelling “condemned” on the garage door. Emergency vehicles from the Sheriff’s Office, Pasco County Ground Inspections, the Fire Department and others circled the property, surrounding the house with yellow tape and shutting off the electricity and water still pumping into the broken home. Minutillo fled to her neighbor’s home. It’s probable she’ll never be able to walk inside her own house at 14003 Shoal Drive. Men from the Fire Department ventured inside her house — too dangerous for anyone else to enter — and brought out her cellphone charger and prescription medications. She sat at the table in a corner of the kitchen while fire officials told her neighbors, Howard and Shirley Taylor, that their home was unsafe as well. They had until 4:30 p.m. to evacuate. They rushed around their home, collecting medications and private documents, while Minutillo sat at the table, making phone calls. Jim Johnston, operations coordinator for Pasco County emergency management, said more than 50 percent of Minutillo’s home had been destroyed by 4 p.m. Wednesday. He said the next step is to determine what else in the area could be affected by the sinkhole, at which point they will be able to determine whether anyone else needs to be evacuated. Minutillo said her insurance company promised to cover the damage. 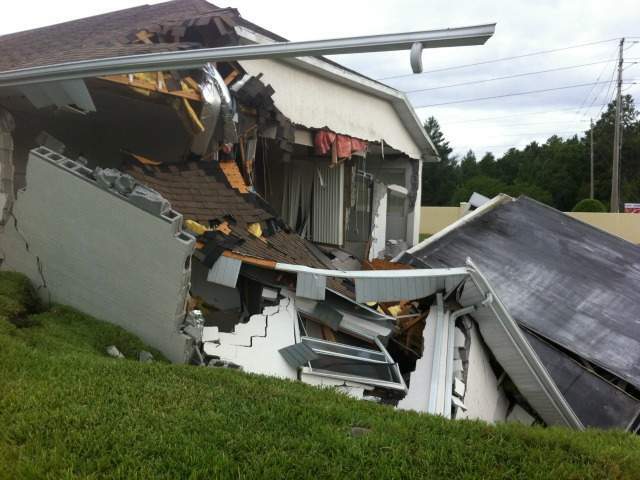 Annette Doying, director of Pasco County emergency management, said a geotechnical engineering company surveyed the damage at the behest of the property insurance company. Due to the afternoon rain, however, the company could not use ground-penetrating radar to assess the sinkhole properly, so it could take several days to determine the damage. Doying said a number of other homes in the neighborhood have had prior sinkhole activity that has been stabilized. Minutillo called her sister in Port Richey, where she hopes to stay for the time being. She said she supposes she will have to rent an apartment, once she finds one. It’s hard to say how long that could take, but she doesn’t want to be a burden. 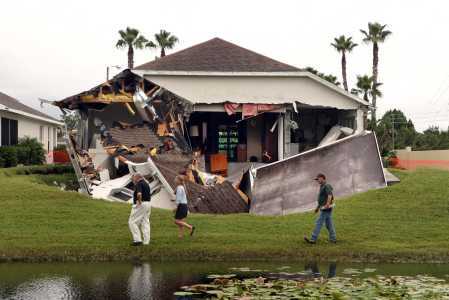 This entry was posted in Pictures, Structure v Sinkhole and tagged Florida, sinkhole, sinkhole v house. Bookmark the permalink. 1 Response to Hudson, Florida. 21st June, 2011.